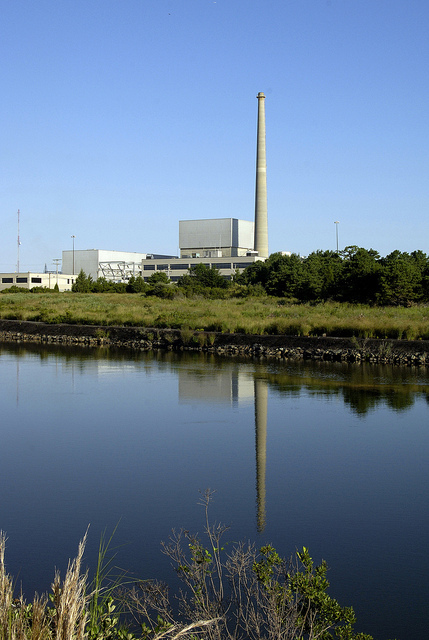 A photo of the Oyster Creek Nuclear Generating Station, Unit 1, located near Forked River, N.J. The NRC staff has issued the findings of the Special Inspection it conducted at the Oyster Creek nuclear power plant to review events related to “Superstorm” Sandy. The inspection was launched on Nov. 13. Our three-member team’s primary focus was the timing of the emergency declarations at the Lacey Township (Ocean County), N.J. facility during the storm. Sandy-generated high water levels at the plant’s water intake structure, prompting first an “Unusual Event” declaration and later an “Alert” declaration. The inspectors also reviewed preparations by Exelon, the plant’s owner, prior to the storm’s arrival; equipment performance; and overall command and control from an emergency preparedness perspective. The inspectors’ report is now available on the NRC website. The team has concluded that the declarations were timely and accurate and that plant personnel appropriately carried out their duties during the storm. At the same time, the inspectors did observe several areas where performance could be improved. Some examples included heightened awareness of emergency declaration thresholds, clearer documentation in control room records and ensuring reliable back-up power for the plant’s emergency operations facility. The report also contains a company-identified violation determined to be of very low safety significance related to the use of incorrect meteorological tower data. In general, the report underscores how plant operators dealt with the harsh conditions at the water intake structure and other challenges, such as the loss of off-site power for a time. While the Special Inspection is finished, the NRC’s Resident Inspectors at Oyster Creek will provide additional observations about plant performance during the storm in an upcoming report. What’s more, an NRC Petition Review Board continues working on a petition, submitted by several environmental organizations, that raises questions regarding plant performance during the storm. The board on Jan. 3rd conducted a public meeting with the petitioners to gather more information about their concerns. As NRC staff made clear, their goal was to listen to the petitioners, though the staff did explain why the NRC denied the petitioners’ request to keep Oyster Creek shut down following the storm. Oyster Creek had their portable FLEX pump (post-Fukushima enhancement) set up to tie it into the service water system in the event that the essential service water pumps would have had to be secured. It would have restored cooling to reactor closed cooling heat exchangers which then in turn cools spent fuel pool heat exchangers without requiring injection into the spent fuel pool. Jeez. it is “fact” because you say so? Dumping water into the pool is not true cooling even if it has the function of helping to cool the temp. This is the problem. There are so many so busy trying to defend things by redefining reality. HVAC does not work when you lose all AC power. You make some very tortured arguments that are heavily dependent on hoping certain things work. You also demand people believe anything you say but sorry, you have done nothing to gain that. The situation at OC has holes in their safety. People want them fixed NOW instead of these constant pointless hair splitting from people who only want to defend the status quo. They need to install a full power back up and back up cooling loop system for the spent fuel pool. Communication and honesty are another animal that needs work but sadly the industry won’t do that unless someone forces them by law to act like decent parts of society. The end of the story is the public didn’t get enough information and certainly not fast enough out of either entity. If deeper technical disclosure about each plant was made publicly available it would allow people to better address these issues and “it is all safe” statements are generally not helpful. Lilly, actually my comments are technically adequate statements and reflect actual nuclear plant operating and safety parameters. I find it somewhat ironic that you say I’m just trying to techno-wabble people, when my comments are consistent with what actually occurred at Oyster Creek and are consistent with press releases from various outlets as well as the NRC’s own report. Basically you are saying that people shouldn’t listen to me because you dont LIKE what I said, not because I’m wrong. Additionally, for someone who wants correct and accurate information to be publicly available, for you to attack someone’s comments for doing that is kind of silly. Also, everything I’ve said reflects actual conditions at Oyster, along with actual conditions at BWR plants, while your claims require assumptions of failures well beyond what would have occurred. Yes Lilly, it is possible for ALL nuclear power plants to potentially lose all on-site and off-site power, and they would have to use a portable pump to cool the spent fuel pool, how barbaric. Feed and bleed accomplishes the critical safety functions of cooling the fuel and shielding workers. You can’t argue that, because it is basic physics. Just because you don’t like it doesn’t mean it’s not correct. This strategy also works without AC power (because it can utilize portable or diesel powered equipment, which Oyster had available). Loss of all on-site and off-site AC power is something that did not occur at Oyster Creek, yet you talk as if it did. Apparently your hypothetical scenarios are more valid than actual scenarios which really occurred. Do you work at Oyster and know something that we dont? The decay heat removal function can easily be accomplished through reactor building HVAC, or as you said, SBGT. Additionally, since the plant was in mode 5 without OPDRVs or fuel moves in effect, secondary containment was not required to be operable. Oyster could have simply opened the reactor building bay doors and vented directly outside. It’s allowed under technical specifications and would remove the steam buildup in the reactor building atmosphere accomplishing the decay heat removal function without electrical power! With regards to 22 feet flooding, you need to recognize that is what their safety analysis assumes. OYSTER AND THE NRC ASSUMES LOSS OF SERVICE WATER PUMPS DURING STORM SURGE. But, critical safety functions are still required to function under this condition through other means. The UFSAR could not say they are capable of surviving 22 feet storm surge if they are not capable of it. And finally, there was a LOT of info out there from credible sources regarding the hurricane and Oyster. The NRC had several press releases, and Exelon made several public comments and press releases. They specifically stated they were in the middle of refuelling, they stated they had a portable pump staged to take over the service water function if it was lost, they specifically stated they had reserve fuel and power for their diesels and that there was no threat to the spent fuel pool cooling system as a result. Information was out there, and this most recent incident with Sandy proved that the NRC and nuclear industry are getting better than ever with releases of information to the public. The NRC was never deceptive about the spent fuel pool cooling vs. ability to put in make up water to prevent fuel uncovering and keep the pool under control. A number of people I know work in the nuclear industry have been busy perpetuating that confusion as did ANS on their website. Instead of speaking clearly they attempted to purposely deceive the public that make up water sources was an actual cooling system. Sadly these same nuclear industry pundits show up on a US government regulatory agency public communications tool and do the same thing here, continuing to try to cloud issues and confuse the public rather than being honest and forthright. No wonder the public has such a level of distrust. These kinds of posts from the industry are problematic and not productive to public discussion, they end up restricting and obstructing the NRC’s communication with the public by offering up many times inaccurate or purposely deceptive technical information in an attempt to shut down conversation. The NRC is in agreement on the need for a good flow of communications during events like “Superstorm” Sandy. That is why we issued five press releases providing updates during the storm, as well as numerous Tweets and blog posts that also shared the latest details. We will continue to evaluate our approach and seek ways to enhance it in ways that will keep the public better informed. NRC Public Affairs Officers did discuss with reporters the amount of time that existed before a complete loss of cooling to the spent fuel pool would lead to the water there to begin to boil. It is correct that it was estimated at about 28 hours. However, it’s important to note that there were alternate means to provide cooling to the pool even if the service water system, which draws water from the intake canal, was unavailable. This includes using water from an on-site storage tank that holds hundreds of thousands of gallons. Also, the expectation would be that the plant operators would intervene long before it ever reached that point. By that we mean that they would be expected to avail themselves of alternate cooling options through the use of procedures developed to address such scenarios. Hiddencamper tries to blind people with a wall of poorly organized techno-babble that really clouds the actual areas of concern. 1. “feed and bleed” ie: dumping water into the spent fuel pool is NOT cooling. The loss of the intake pumps loses spent fuel pool cooling capability. The replacing water into an evaporating pool creates lots of other challenges like a refueling floor filling full of steam and excess moisture. If the SGTS isn’t available there isn’t a way to pull steam out of the refueling floor. Loss of AC power would disable the SGTS so if the generator dropped they have yet another problem and the multiple problems or cascading problems are when the bigger trouble begins. This is why people have so much concern, too many times these situations are highly dependent on hoping one piece of equipment keeps working so things don’t start spiraling out of control. Oyster Creek does not have a back up spent fuel pool cooling system and needs one. The NRC needs to make that upgrade get done sooner, not later. Sandy points out exactly why that improvement needs to be done. 2. Portable pumps make no difference if there is no way to operate the spent fuel pool cooling loop. Since they have no back up power system yet if they lose AC power they lose that system. I am also not aware of any actual changes done to tie in a portable pump to the spent fuel pool cooling loop to operate it using a portable pump to move the sea water side of the loop. Again, the public is largely left in the dark. 3. Fire water injection is an emergency measure. Good luck getting a fire truck in if a hurricane trashes the one access bridge into Oyster Creek. If your down to injecting water with a fire truck there are bigger issues going on. 4. The 22 foot flood level at Oyster Creek is utterly irrelevant to the actual public concerns with what went on at OC. Since the intakes have to shut down at 7.4 to 10 feet and then loses plant access to the ultimate heat sink it puts the plant into a challenged condition and the public has every right to not be amused by such a situation especially during a hurricane where most of the warning sirens were down and the ability to evacuate would have been impossible. 5. Loss of AC power is a legit concern. My biggest concern with this incident is the lack of decent communication. The public lacks access to a decent overview of plant systems. This caused lots of information gaps that actually caused MORE public concern than if the public had that information. The conflicting and days later information made it worse. Don’t be indignant that the public is concerned about a situation at a nuclear plant when the operator refuses to be accountable to the public and the NRC only informs the public of critical information months later. My concern is that they figured all of this out in the middle of a storm and it was apparently missed in all prep over the years. That the actual pump height was 10 feet not 7.4 and that they had no measuring capability over those levels. Having the measuring capability only to the NRC alert level satisfies notifying the NRC at the right level but does nothing for actually dealing with rising water vs. the pump motors so they could de-power them before water would hit. The installed level measuring equipment is adequate for detecting and transmitting levels which translate to emergency action level declarations (greater than 4.5 feet above mean sea level for an “Unusual Event” and greater than 6 feet above mean sea level for an “Alert”) and those that procedurally require a change to plant operations (greater than 4.5 feet above mean sea level – commence a normal plant shutdown; and greater than 6 feet above mean sea level – scram the reactor). Once above the 6-foot level, the only actions that can be taken are to shut off electric pumps before their motors are flooded. As a corrective action following “Superstorm” Sandy, Oyster Creek is installing a visible mark, below the bottom of the motor on each of the pumps which could be affected by a high intake level. The mark gives operators an easily viewed indication to tell them when to shut a particular pump off. If intake level ever reached the point at which the pump motors were submerged, there are no other actions for operators to take, so accurate measurements of the level would not a determinant on how to proceed next. And a second reply, there were no safety problems, there was no close call, the plant was still within its reference design basis, and with everything in cold shutdown there was a lot of time to handle any issues. The only thing I could see as lessons learned based on everything I’ve read, is improvements for organizational preparedness when severe weather is expected. In other words, just as the NRC said, everything was effective and timely. First, 28 hours includes the reactor core, as the fuel gates were removed. This is a VERY long time for the reactor core to reach boiling. Typically 10 days after shutdown the core will boil in less than 1/2 that amount of time. Second, this is only time to boil. With core decay heat it would still take over a day or two prior to water lowering to a level where radiological conditions could be an issue. Third, is there would have been no loss of any other plant systems. Injection systems would have still worked, and engine driven fire pumps would have worked, to provide feed and bleed cooling of the spent fuel pool. Other strategies could have likely been employed. One also needs to consider that Oyster had their FLEX pump (a post-fukushima portable pump), out and was preparing to use it to restore essential service water systems if the service water pumps failed or had to be secured. Fourth, is that it is very easy, in a 28-50+ hour timeframe to get portable pumps or fire trucks onto site to inject to cool the reactor and spent fuel pool. Fifth, is that the plant is designed for a 22 foot flood, which means that assumes a total loss of service water for a period of time, as the pumps would be submerged. In fact Oyster would have shut down their service water pumps if waters threatened them, then after water levels rescinded, they would have cleaned them up and restored them to service, if thats what happened. Boiling is not the end all be all, and there are plenty of options to manage an event like that, especially considering that Oyster had all diesel generators available, and had their combustion turbine (a small power turbine dedicated to the site a couple miles away) available throughout the event. Complimenting the NRC is a bit strange seeing Oyster Creek SFP would have boiled in 28 hours if operator action had not been taken. It was a close call and action is needed to avoid several safety problems learned from this incident. The good thing is the report is Very consistent with all reports I’ve seen from legitimate sources during the hurricane. The sad thing is there are likely going to be people who are disappointed that nothing wrong was found. Neil, your important department has a thankless job! I was dismayed to hear reconfirmed on NYC 1 cable here just how many on-site fatalities and injuries yearly occur at oil and coal and gas electric generating plants around the nation that don’t make any news as a matter of “routine” industrial accidents, yet the media are staked out like vultures waiting for just one such incident to occur at a nuclear plant so to blare it out to exaggerate perils and condemn the whole concept. There just aren’t kudos enough for the safety record of nuclear plants and the oversight of the NRC!! Regarding the rising water level…..It is interesting that it was determined that when the water level was greater than 6 feet it would trigger an action but the deck was only six feet and the measurement higher than that had to be taken with a staff gauge. Then when it was determined to have reached 7 feet the the staff gauge which was being used did not measure above 7 feet and they had to resort to another measurement above the water intake pump to get the 7.4 level. All the measuring devices used seem to have been inadequate. If only 7 feet can be measured (rather haphazardly during this event) and the danger zone is 22 feet. shouldn’t the plant have measuring equipment that can better handle higher levels? http://pbadupws.nrc.gov/docs/ML1301/ML13010A470.pdf is the direct link., which would have been helpful. The way the Oyster Creek staff handled the change to the water level required to secure the service water pumps was interesting. Clearly this arose from a good understanding of both the requirements of the emergency operating procedure and the capabilities of the plants. All done quickly, correctly and professionally. The link to the inspection report has been corrected. This leaves a couple of questions. Why was the public never told of the 10 foot pump height change? Lack of that information caused conflicting public information that 7 foot would cause pump shutdown yet water was at 7.4 but the pumps hadn’t been shut down. The public and a number of people in the media has been trying to find out what the actual refueling situation was during Sandy. No information was given leading to speculation that caused more problems than if the NRC or Exelon had told the public the actual situation that 10 assemblies had been moved and the reactor was open. I saw one media report claim the entire core had been offloaded into the pool. Without information to counter things like this the lack of information can cause bigger problems. The public was also not told that cooling for the SFP and the reactor was out for an hour. While technically not a huge deal the public does have a right to know what is going on. Also, if the public had been told the 28 hour to boiling estimate it would have given the public some context. This was a big mess full of miscommunication and an information vacuum. That information vacuum probably worried more people than any of the actual information could. The public also has a right to know in a timely manner. Thank you for this post, for the special inspection, for continued follow-up reporting, and for collaboration with those concerned. You state the report can be found “here” but it leads you to a site that either does not have it yet or you did not give enough information to the reader to search for it. An IR # would really help in your blog. Next Next post: Force-on-Force or Was That a Gunfight at a Nuclear Power Plant?